I first featured the Amsco Cardboard Adventure Sets of the 1970s here on my blog way back on September 29, 2005. But, every now and then -- especially if the toy is Space: 1999 related -- I enjoy hauling out a collectible a second or third time. 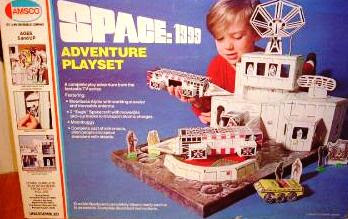 So today, I’m once again featuring the Space: 1999 Cardboard Adventure Playset, in honor of Saturday, which is Breakaway Day 2014. A little background: In the early-to-mid 1970s, Amsco and Milton Bradley cooperated to produce four cardboard play-sets (for Marvel Comics, Planet of the Apes, The Waltons and Space:1999 ). These giant Amsco dioramas were packaged in large, attractive and colorful rectangular boxes, were produced from "durable" cardboard, and were advertised as "fun to assemble,"
The kit you see pictured comes from Gerry and Sylvia Anderson's outer space epic, Space:1999 (1975 -1977) and is a diorama of the lunar installation, Moonbase Alpha. 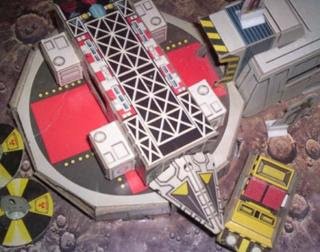 As you can see, there's a landing pad, a cross-section of Moonbase Alpha's interior, including Main Mission Tower, a yellow moon-buggy, and plenty of cardboard representations of characters and aliens. Also, the set comes with two Eagle spacecraft and two nuclear charges, the latter for detonating asteroids. The heroes in the Space:1999 set are made in the likenesses of Martin Landau's Commander John Koenig, Barbara Bain's Helena Russell, Barry Morse's Professor Victor Bergman and even Clifton Jones' David Kano. Unfortunately, the set was produced pre-Maya, so there's no Catherine Schell figure here. One thing I enjoy about this particular set is that some effort was made towards accuracy in terms of the figure personalities (if not the Moonbase interiors). For instance, three cardboard figures in the Space:1999 set are aliens directly from Year One episodes. Peter Cushing's Raan, from "Missing Link" is here with his daughter, Vanna. The popular and horrifying octopus-like monster from "Dragon's Domain" is featured as well (with a puddle of drool/goo...). Even the scorched Zoref (Ian McShane) from the episode, "Force of Life" is included in the set. The Alphan figures can inhabit the base, and even ride a working elevator from one level to the next. One door in the interior leads right out to the docking port, where the docked Eagle is stationed. One figure is a blond astronaut, who I insist is actually Captain Alan Carter (Nick Tate), although his hair isn’t quite right. The female technician looks to be modeled after Sarah Bullen who played Kate in several episodes of Seasons 1 and 2. Curiously, her outfit looks more like a Season 2 outfit rather than the crew neck outfits from Season 1, but it's possible they just followed the style of Commander Koenig's uniform. I loved this set as a kid!